Search engine optimization (SEO) is a key strategy in building a business profile and attracting customers. However, few small businesses have the time or resources to focus on their online presence since manpower is better dedicated to core workplace growth. This is why SEO companies are often employed—to provide focused SEO efforts while keeping the on-location distractions to a minimum. With the right SEO company in Toronto, your small business will enjoy higher Google rankings, a heightened web presence, and better trust and authority among your audience. The key, of course, is finding the right company for your business. As with many industries, SEO suffers from less-than-reputable companies that try to lure in customers with false promises and discredited approaches. At best, using one of these companies will get you little in the way of long-term growth. At worst, their “black hat” SEO techniques can get your web site penalized by Google and set you back even further. The good news is that you can easily tell the good from the bad by paying attention to a few key points. The idea that a few easy payments can give you a top spot on Google is tempting but simply impossible. Organic listings cannot be bought and are the result of Google’s myriad algorithms. An SEO company can offer optimization services, consulting, social media integration, and other actions to help build links and visibility, but “paid organic listing” is just an oxymoron. Companies that focus on the promise of rocketing you up to the top three search results are doing you a disservice. While search rankings are obviously important, they are not a hard-and-fast indicator of success. Remember that Google’s search results are a combination of search terms, individual preference and history, and geography. A web site ranking lower on general searches might end up higher on local ones. Serious customers—the ones most likely to be converted—are also more prone to looking past the first page of results. While wanting a good ranking is perfectly fine, keep in mind that traffic and visitor conversion are often better signs of success. SEO is not an overnight process. There is no switch that can be flipped to suddenly put you at the forefront of the internet. If a company offers you fast and guaranteed results, turn away. SEO is a long-term, subtle process that builds your presence over time through quality content and social media approaches. Google’s algorithms are specifically designed to prevent a newcomer from suddenly rocketing up overnight. Once you have narrowed down your options to a set of legitimate candidates, it’s time to quiz them on their practices. Every company operates slightly differently and these differences will affect how much they can help you. Consider asking any or all of the following questions to get a sense for your candidates’ capabilities. Do you provide both on- and off-page SEO? On-page SEO refers to things like web design, coding, and content. Off-page is elements like link building or social media optimization. How much you want to focus on one or both of these will depend on your own situation and preferences, but it’s important to know what you’re getting into regardless. Circumstances can change, after all, and if you find yourself wanting to expand, it’s easier if you don’t need to find another company to work with. How many links will you build and how? SEO companies have access to a lot of back-end data that lets them estimate how well they can build links for you as well as understand what has worked in the past for other clients. It’s important to remember that more is not always better when links are concerned since too much link building in a short period can trip some of Google’s warnings. Be sure to ask for a list of websites where the company plans on building your links and check to see if they’re legitimate. Remember that the key is natural links and organic traffic, not the appearance of natural links and organic traffic. The need to avoid startling Google is also why you should be wary of companies that employ automated link-building software. Some automatization software is fine depending on how it’s used, but things like content, social media publishing, and link building is best done by hand. An established SEO company needs a way to prove their credibility, just like any other business. References from past clients, case studies, and online reviews are all potential avenues you can explore for establishing whether what you’re being told is genuine or just marketing bluster. Some people have trouble talking about prices, but it’s always a crucial point to clarify. Transparency and clear cost breakdowns are non-negotiable points when entering into a business relationship. If there are fees you don’t understand, don’t be afraid to ask. SEO companies can charge hourly, monthly, quarterly, annually, based on link or web page numbers, or per piece of content. Some also offer variable models. Finding an SEO company that matches your budget is not something to hesitate on. Whether the company calls it a project manager, client representative, or case worker, there should be someone on hand to act as your primary source of contact and information. Get to know them and learn about their availability and knowledge. If you wish, you can also inquire about the specific people who will be working on your site and content. Becoming comfortable with and confident in those who will be providing your SEO services is never a bad thing. Numero Uno Web Solutions is an SEO company in Toronto that provides content marketing and mobile optimization solutions to startups and small companies from all industries and fields. We stay on the pulse of industry changes and adapt our practices to produce quality SEO and mobile optimization plans to fuel the growth of businesses across communities. 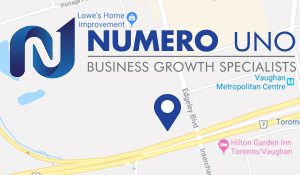 Contact us at info@numerounoweb.com or at 905-856-2012 to learn more about marketing techniques and how we can help improve your search profile across all platforms.